Our sedans are stylishly sleek and can serve as a comfortable, relaxing ride for up to 1-4 Passengers.This vehicles has Tinted Windows,Luxurious Leather Interior,CD Sound System, 1 foot extra leg room, Extra large trunk for up to 3 big suit cases. Comfortable leather seating for 10 passengers, mood lighting and crystal bar add elegance and ambiance to your evening. Amenities include AM/FM Stereo, CD Player, TV/VCR, tinted windows, privacy partition and interior ice chest. 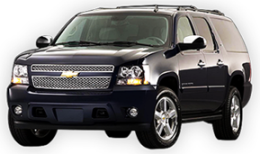 SUV limousine with up to 14 passenger capacity. Like the Stretch Excursion, this limousine is equipped with moon roof, bar, am/fm stereo with CD stereo system, LCD TVs, fibre optic and strobe lights, intercom, bar with built in ice chests and a privacy window.